Ubisoft just fattened up Tom Clancy&apos;s The Division 2&apos;s pre-order bonuses on PC, with the company announcing today that players will be able to claim a free game from a select number of major Ubisoft titles if they pre-purchase a digital copy. 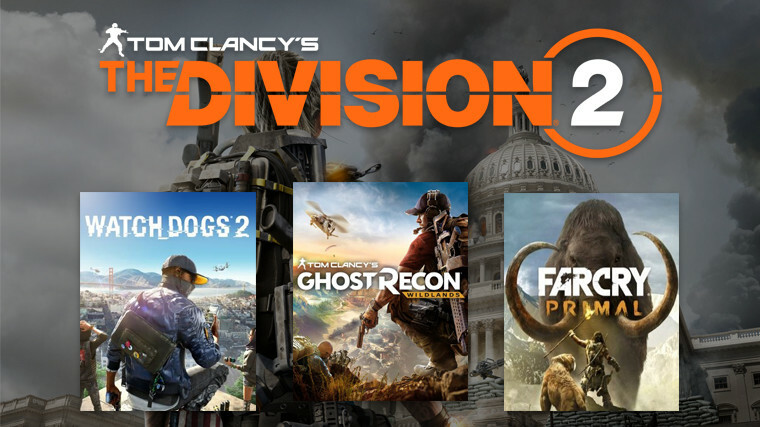 The promotion gives players a choice between three games, which include the standard editions of Watch Dogs 2, Tom Clancy’s Ghost Recon Wildlands, and Far Cry Primal. Once the pre-order is connected to the Uplay profile of a player, they may head to this newly set up page to choose their game. Interested players don&apos;t need to pre-order The Division 2 straight from the Uplay store to be eligible either, with Ubisoft saying the offer applies to the Epic Games Store and any of its other approved distribution partners - just not Steam. The full list of these partnered stores can be found here. Ubisoft also confirmed that players who pre-ordered the game before this announcement are eligible for the free game as well. This PC exclusive pre-order offer will be available to claim until March 31, giving players two whole weeks after the game&apos;s launch to grab their freebie. The selected free game will be delivered on the same day that The Division 2 is slated to launch, March 15. Meanwhile, those who are looking to try the open-world action RPG beforehand can do so on March 1, which is when the open beta will kick off. Published on Wed, 13 Feb 2019 20:02:01 GMT, © All rights reserved by the publisher.